Attending a flower show can, at the very least, provide florists with new inspiration and tips for their businesses and at most provide them with new clients, business contacts and maybe even contracts for work. Florists who do decide to attend a flower show should consider if they want to exhibit, network, research or judge and plan their attendance accordingly. Exhibiting at a flower show usually means competing for some sort of honour, award and/or prize. If you want to exhibit at a particular flower show, attend the show the year before so that you get an idea of the types of exhibitions to be found and can see for yourself those that win accolades. Then obtain a timeline and guidelines for applying to exhibit at the show the next year. When you plan your exhibit, keep the rules (sometimes called the schedule) in mind at all times. You will be judged against the schedule so don't take yourself out of the competition unnecessarily by not following it to the letter. Bring along tags for your exhibit so that you can mark out the types of flowers you have used in your displays. When you set up your exhibit, make sure that it is as neat and clean as possible and that you are as well. If it is allowed, bring promotional literature for your floristry services or shops and consider arranging for a photographer so that you can use these professional pictures in your future advertisements and/or portfolio. Just make sure that all of these things are allowed in the rules of the show before you make any firm bookings or spend any money on them. Even if you are not exhibiting at a flower show you can still use this event for professional networking. First and foremost make sure that you look neat and presentable as you will be representing your floristry business at the show. Bring along business cards and give them out whenever you engage with someone (if this is allowed at the show). Talk to exhibitors and don't be afraid to ask technical questions. If workshops, seminars or lectures are part of a flower show then by all means attend and mingle. If a cocktail party, gala dinner or even business lunch is offered as part of a show then make it your business to attend. Prepare yourself prior to these events by studying an attendee list if one is available and possibly by preparing a few conversation starters or questions that you can use to get some small talk started. Don't let vague offers of future meetings slip by either, be ready to make a firm date with anyone interested in doing business in the future. 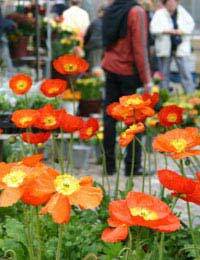 Flower shows can be great places for florists to conduct research. Not only can you gain inspiration from the exhibits, but you may also be able to pick up some tips from the exhibits and exhibitors as well. Make sure you bring a small notepad and pen with you so that you can jot down ideas and information as it comes to you. If you are making notes on a new contact, don't forget to write down something descriptive such as "beautiful tulip displays" or "chatted about best flower markets" so that you will be able to remember this person later. Taking samples of exhibitors' professional literature and flipping through any portfolios that are on display are also easy ways to research others' advertising and marketing techniques. Whatever you do though, don't be rude or aggressive while you research and certainly don't break any show rules either. Professional florists may be able to act as judges at flower shows, particularly in shows that take place in their own local communities. Not only will judging at a flower show allow you to make new contacts, show off your expertise and add a little something to your CV, but it will also act as free advertising for your floristry business and put you in contact with potential new clients, customers, students and even friends. Depending on the show you may also be able to offer a demonstration, run a workshop or give a lecture. If you are interested in doing any of these things, get in contact with the show organisers as early as possible to find out their criteria for judges or contributors as well as if you will need to put in any submissions or go through any interviews. If possible, attend a flower show at least once before putting yourself forward for any sort of judging position, and consider putting yourself forward to volunteer before or instead of judging as well. Attending a flower show offers a number of roles, activities and benefits for professional florists. Exhibiting, networking, researching and judging at flower shows are all possibilities for florists.